Preface. List of Contributors. Part I. General. Mesozoic hydrocarbon source-rocks of the Arctic region (T.L. Leith et al.). Natural gas hydrates: Arctic and Nordic Sea potential (M.D. Max, A. Lowrie). Part II. Greenland. The southern West Greenland continental shelf - was petroleum exploration abandoned prematurely? (J.A. Chalmers, T.C.R. Pulvertaft). Depositional history and petroleum geology of the Carboniferous to Cretaceous sediments in the northern part of East Greenland (L. Stemmerik et al.). Evidence for wrenching during Mid-Permian extension in central East Greenland (D.Q. Coffield). Moscovian bryozoan-dominated build-ups, northern Amdrup Land, eastern North Greenland (L. Stemmerik). Sedimentology and diagenesis of the Upper Permian Wegener Halvø Formation carbonates along the margins of the Jameson Land Basin, East Greenland (L. Stemmerik et al.). Part III. North American Arctic. T-R sequence stratigraphy, facies analysis and reservoir distribution in the uppermost Triassic-Lower Jurassic succession, western Sverdrup Basin, Arctic Canada (A.F. Embry, E.P. Johannessen). Evaluation of maturity and source rock potential in the Lougheed Island area of central Sverdrup Basin, Arctic Canada (F. Goodarzi et al.). The source-rock potential and thermal maturity of the sedimentary succession in the Drake and Hecla hydrocarbon fields, Melville Island, Canadian Arctic Archipelago (T. Gentzis, F. Goodarzi). Hydrocarbon potential of the St. George Basin, Bering Sea, Alaska (K. Carter, I. Lerche). Hydrocarbon loss from oil and gas fields of the Sverdrup Basin, Canadian Arctic Islands (D.C. Waylett, A.F. Embry). Crockerland - The northwest source area for the Sverdrup Basin, Canadian Arctic Islands (A.F. Embry). Carboniferous and Permian reefs of Sverdrup Basin, Canadian Arctic: An aid to Barents Sea exploration (B. Beauchamp). Part IV. Soviet Arctic. Main results of oil and gas prospecting in the Barents and Kara Sea inspire optimism (B.K. Ostisty, Y.F. Fedorovsky). Main petrolifereous Mesozoic complexes of the Arctic regions of western Siberia (I.I. Nesterov et al.). The Jurassic complex of the Barents Sea as a hydrocarbon exploration target (E.V. Zakharov, I.B. Kulibakina and G.N. Bogoslovskaya). The geology of Palaeozoic hydrocarbons in the eastern European U.S.S.R. and their relevance to the Barents Shelf (A. Heafford). Part V. Barents Sea: Overview. Hydrocarbon potential in the Barents Sea region: Play distribution and potential (S.E. Johansen et al.). Hydrocarbon potential of the Norwegian Barents Sea based on recent well results (R.M. Larsen, T. Fjæran and O. Skarpnes). 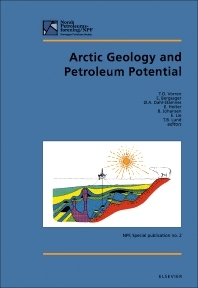 Hydrocarbon potential of the central Spitsbergen basin (A. Nøttvedt et al.) Svalbard-Barents Sea correlation: A short review (A. Nøttvedt et al.). Part VI. Barents Sea: Palaeozoic. Late Palaeozoic bioherm occurrences of the Finnmark Shelf, Norwegian Barents Sea: Analogues and regional significance (J.R. Bruce, D.F. Toomey). Exploration of the Late Palaeozoic Carbonates in the southern Barents Sea - A seismic stratigraphic study (K.T. Nilsen, E. Hendriksen and G.B. Larsen). Eastern Barents Sea late Palaeozoic setting and potential source rocks (C. Alsgaard). Carbonate sequence stratigraphy: Application to the determination of play-models in the Upper Paleozoic succession of the Barents Sea, offshore northern Norway (M. Cecchi). Part VII. Barents Sea: Mesozoic. Use of sequence stratigraphy to define a semi-stratigraphic play in Anisian sequences, southwest Barents Sea (A. Rasmussen et al.). Triassic Rocks in Svalbard, the Arctic Soviet islands and the Barents shelf: bearing on their correlations (A. Mørk et al.). Apparent changes in clastic mineralogy of the Triassic-Jurassic succession, Norwegian Barents Sea: Possible implications for palaeodrainage and subsidence (M. Bergan, R. Knarud). Dinoflagellate biostratigraphy of the Toarcian to Lower Ofordian (Jurassic) of the Barents Sea region (M. Smelror and R. Below). Triassic sequence stratigraphy in the Barents Sea (P. Van Veen et al.). Part VIII. Barents Sea: Cenozoic. Mid-Late Miocene sedimentation on the southwestern Barents Shelf margin (G. Richardsen et al.). Late Miocene-Pleistocene sequence stratigraphy and mass-movements on the western Barents Sea margin. (S.M. Knutsen, G. Richardsen and T.O. Vorren). Restoration of the eroded section in the western Barents Sea (T.R. Nardin, K.G. Røssland). An outline of the northwestern Svalbard continental margin (O. Eiken). Reactivation of fault complexes in the Loppa high area, southwestern Barents Sea (R.H. Gabrielsen, I. Grunnaleite and S. Ottesen). Cenozoic uplift and erosion of the Barents Sea - Evidence from the Svalis dome area (H. Løseth et al.). Part IX. Salt Dynamics. Multiphase halokinesis in the Nordkapp basin (C. Talbot, J. Clark). Salt dynamics: Simulation of mushroom cap on a salt diapir in the Barents Sea, Norway (Z. Yu, I. Lerche). Part X. Methods. Application of horizontal stress directions interpreted from borehole breakouts recorded by four-arm dipmeter tools (A. Linjordet, O. Skarpnes). A method on classification of oil traps based on heavy oil content in cores with relevance to filling and drainage of Barents Sea oil-bearing structures (J.H. Augustson). The snowstreamer - A new device for acquisition of seismic data on land (E. Rygg et al.). Effects on hydrocarbon potential caused by Tertiary uplift and erosion in the Barents Sea (J.I. Skagen). International Law and its application in the Arctic (C.A. Fleischer). References index. Subject index. Since the search for hydrocarbon resources in the Arctic started in the 1930's the exploration activity has expanded into many of the Arctic regions, and several of the Arctic sedimentary basins have proven to be important sources of hydrocarbon. Nevertheless, the Arctic continental margins and adjacent onshore areas are still largely unexplored in the context of petroleum, and are therefore considered to be one of the few regions in the world where significant undiscovered sources of hydrocarbon may exist. The aim of the book is to give an updated overview of the geology of the Arctic sedimentary basins and their petroleum potential. Although the different basins vary significantly as regards sedimentary fill and tectonic evolution, many of the basins share some of the characteristics needed to become prolific oil and gas provinces. The book contains 45 extensively illustrated articles. It starts with papers on the Mesozoic source rocks, and oceanic natural gas clatrates in the Arctic, respectively. Then follow articles on the regional and petroleum geology of the main regions; Greenland, North American Arctic, Soviet Arctic and the Barents Sea. Particular emphasis is placed on the Barents Sea. The two last chapters comprise articles on salt dynamics and methods. The book closes with a paper on international law in the Arctic. This volume will be of interest to both students and professional earth scientists/petroleum explorationists working in the northern latitudes. It will allow the readers to stay abreast of the development in this climatic region of the world.